A Model. 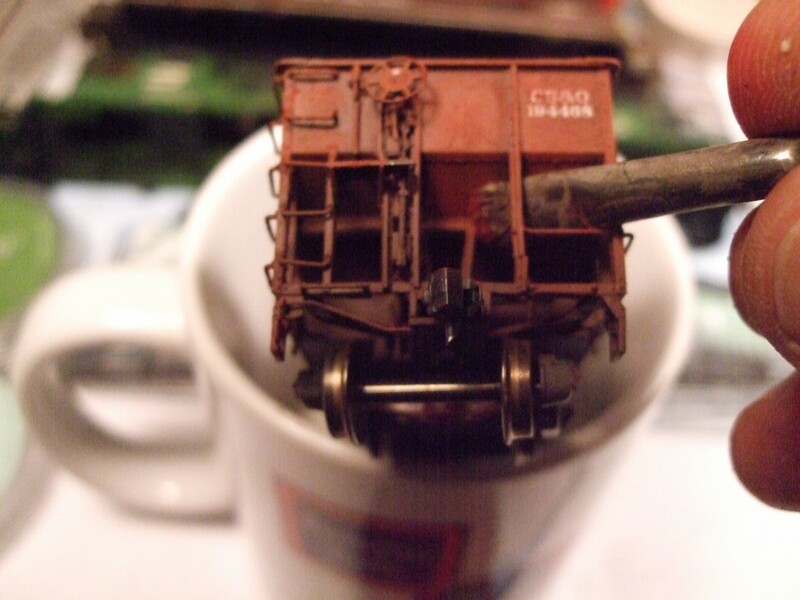 This is our first subject, a Proto 2000 War Emergency Hopper. Here is the cleaned up car with the PanPastel and Sofft Mini Applicator. 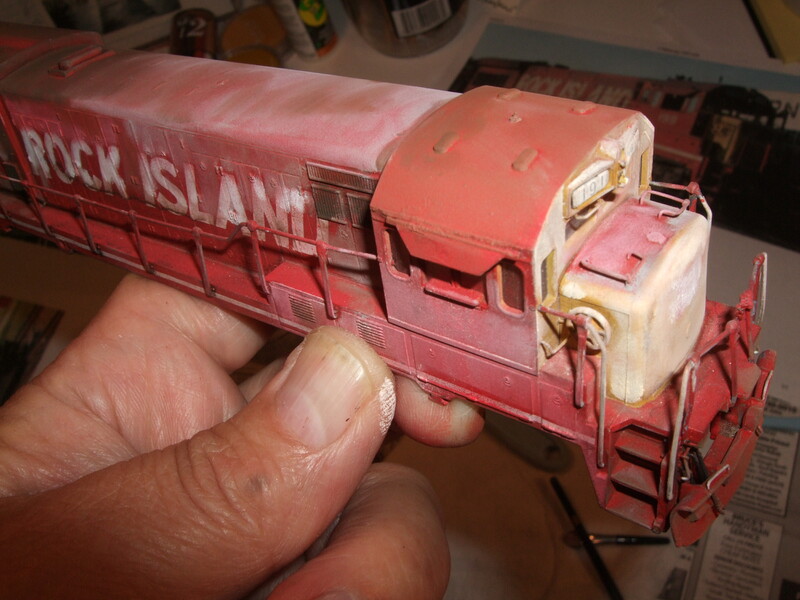 The car was scrubbed down with a Mr. Clean® pad to remove the previous airbrush weathering. Then the model was washed with Dawn and water. A Flat finish of Model Master® was reapplied to the car. Note: this applies to all models in this post. 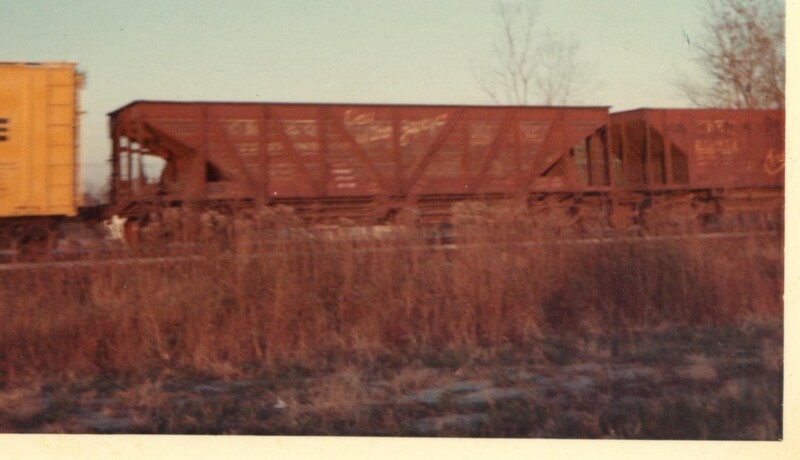 Emergency HT-8, 55 Ton hopper. The horizontal lines represent wooden boards that were used instead of much needed steel for the WW 2 war effort. I am using the edge of the Soft Knife with Cover (FLAT) to draw in the outside braces. Don’t worry about going over the edge. We’ll clean it up to the edge of the braces later. Above – I applied the overall color with the Sofft Knife with Cover and now I am using the stiff bristle artist oil painter brush on harder to reach details and panels. Lightly, as in no pressure, drag the brush over the pan surface to acquire the color. Don’t scrape the pigment out of the pan, it was designed to stay in its house. Don’t forget to do the slope sheets hidden in back of the ladder uprights. See how close with a large brush I was able to get to the lettering. I also use the Papermate® White Magic Eraser * to clean up the lettering and car number. ( *Available at most office or art supply stores). I can remove the excess pastel over the white lettering with my Papermate® White eraser. 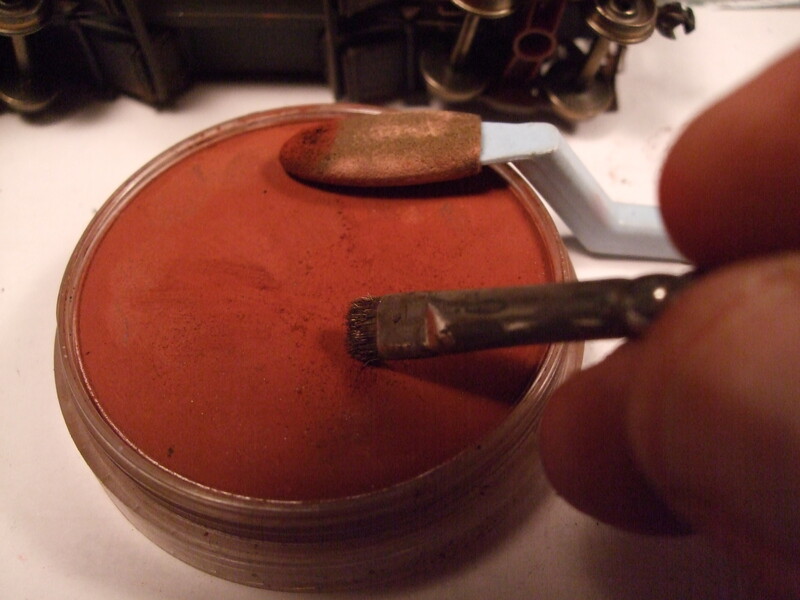 I can even clean up some of the 380.3 Red Iron Oxide Shade from the boards. WHY? Because I will weather the boards to a silvery gray to resemble a sun bleached wood color or a darker brown to represent wood with deeper grains. 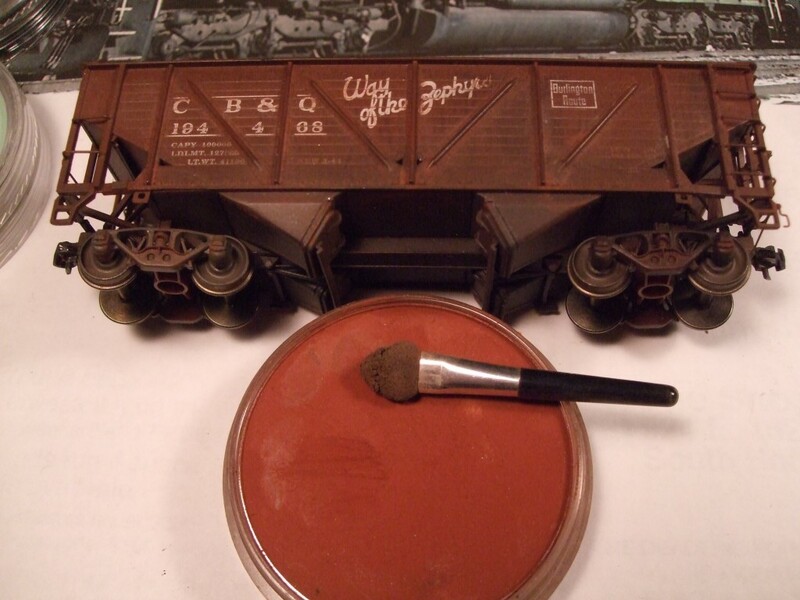 Colors used were 820.5 Neutral Gray and 740.3 Burnt Sienna Shade. 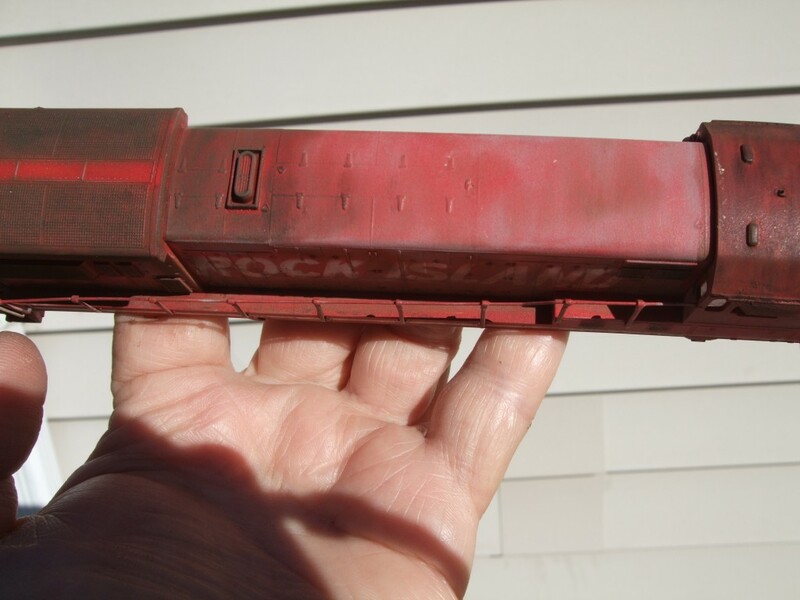 The Burlington painted its trucks the same shade of Mineral Red as the freight car body. 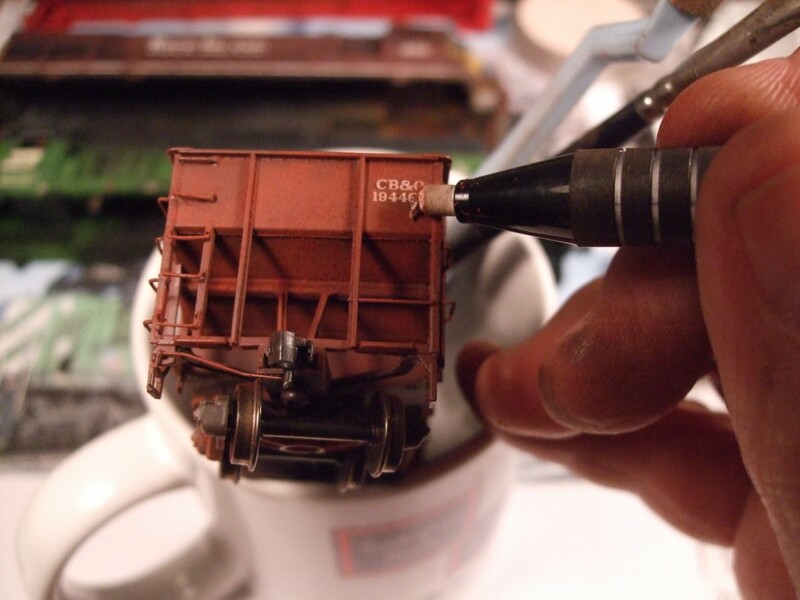 The model trucks were originally painted a dark brown or weathered black (really dark gray). 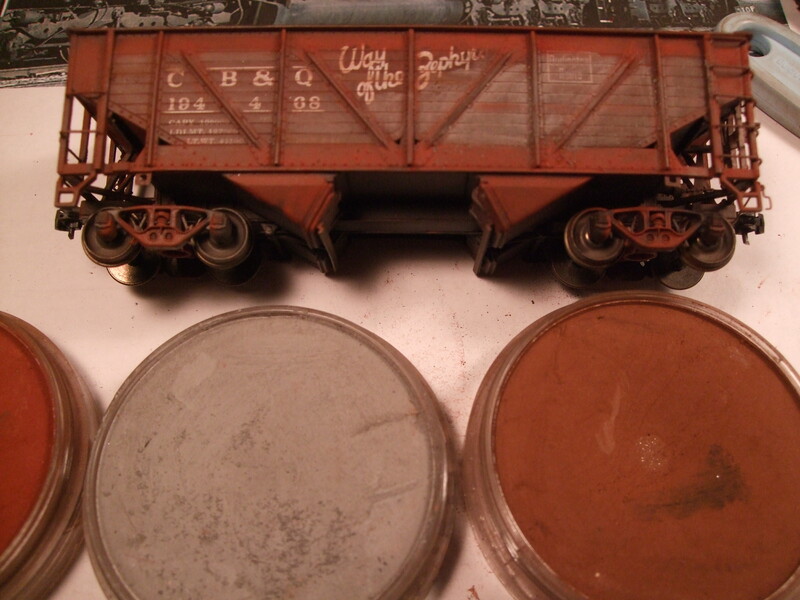 I have re-accentuated the truck color with 380.3 Red Iron Oxide Shade. 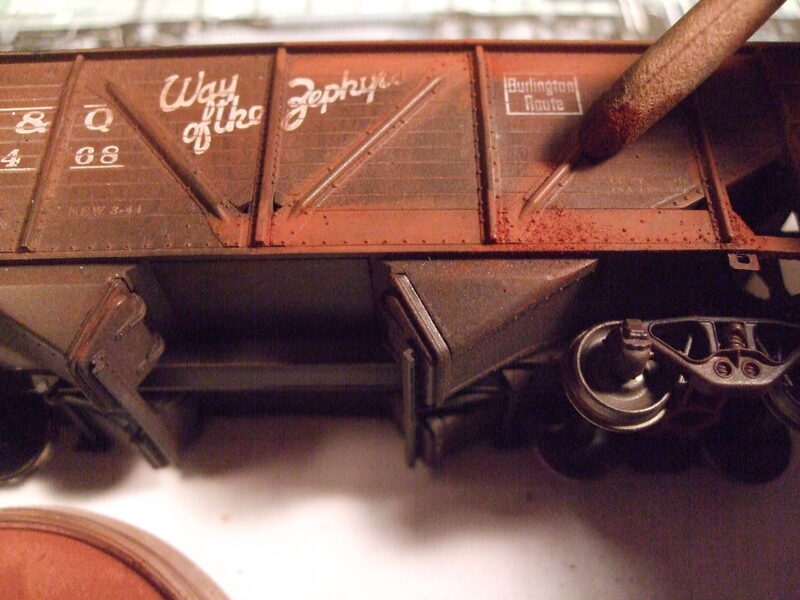 The sides of the hopper discharge bays were highlighted with 380.3 Red Iron Oxide Shade. 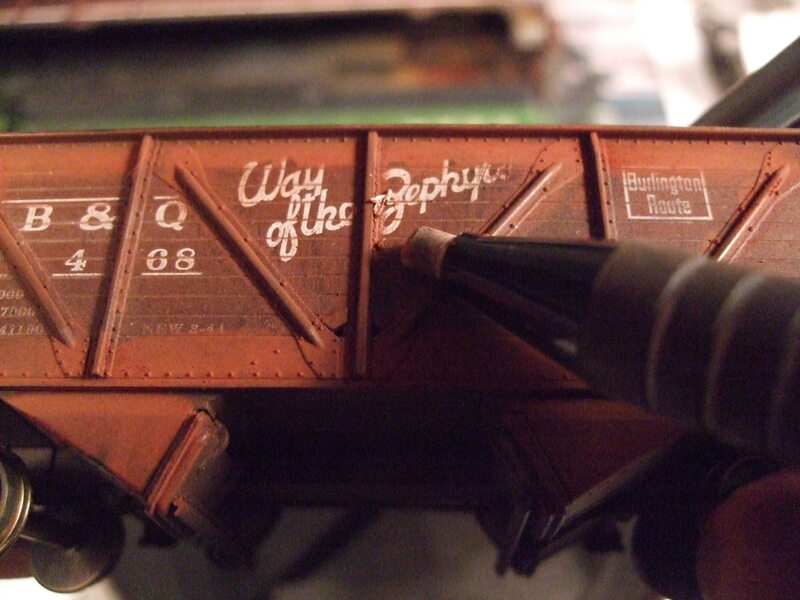 You can use the 013 Pearl Medium-Black Fine on the bays to represent coal dust and the journal bearing covers on the trucks to simulate leaking grease. 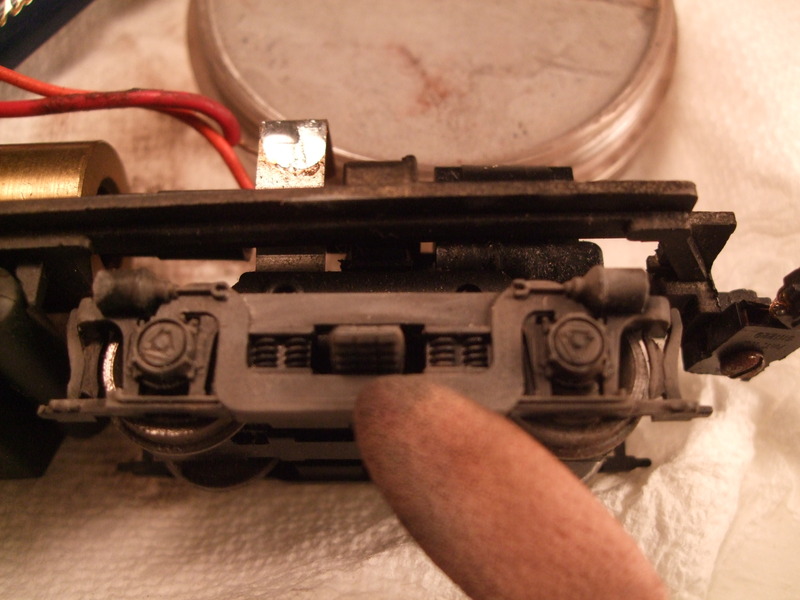 The bearing on the left hasn’t been treated here. Now this hopper took me about 4 or 5 minutes to do as I was photographing the various steps for the blog. With all the colors and brushes at hand you can cut the time in half. Not bad if you have to do a fleet of hoppers. 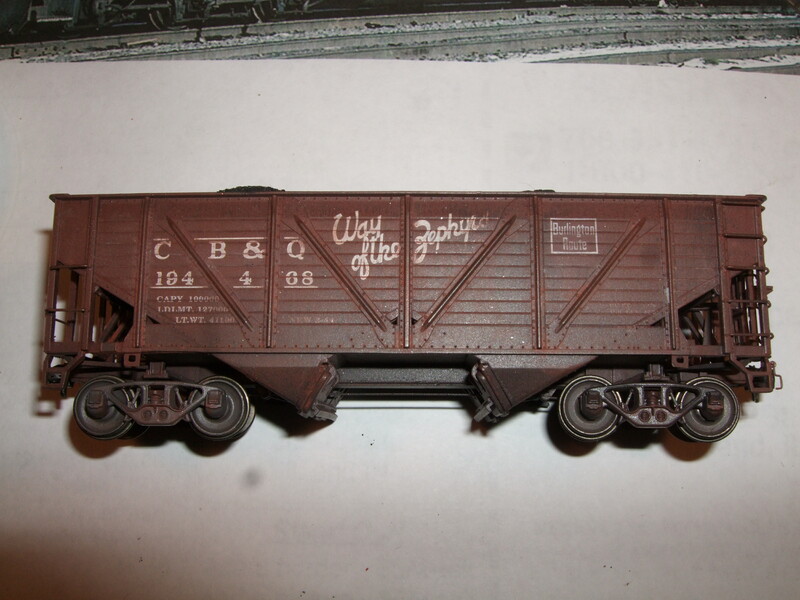 Remember not all your hoppers will be composite wood and steel. 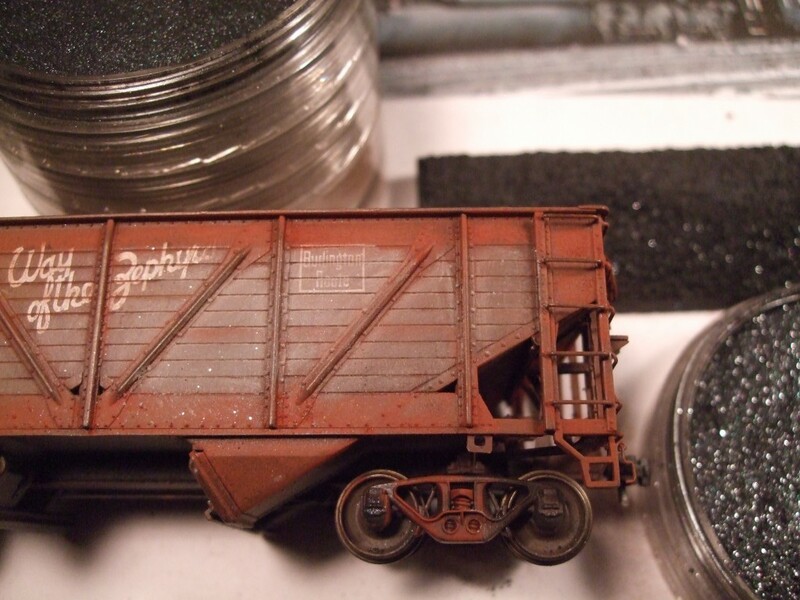 We’ll talk about steel hoppers and interiors at a later blog. 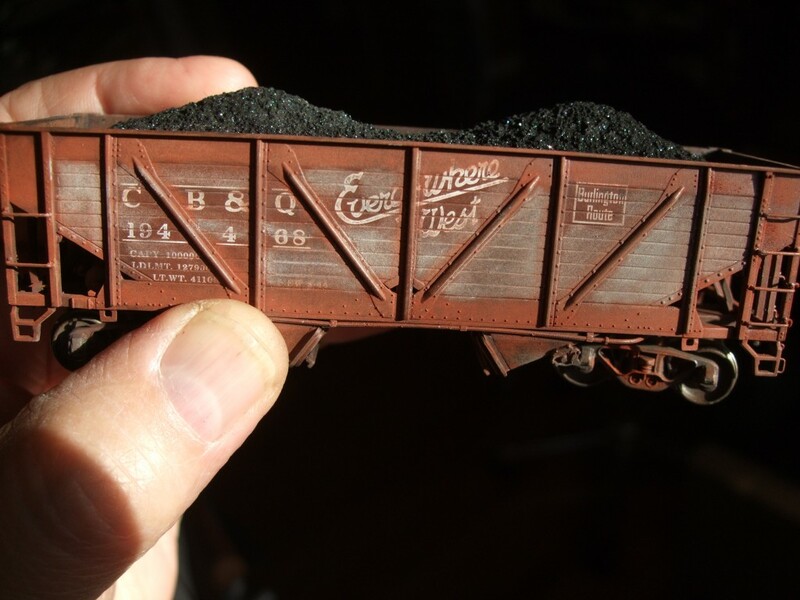 The cast resin coal load was painted with a Flat Black acrylic paint and when dry covered with 014 Pearl Medium –Black Coarse. This will give you a realistic and impressive SPARKLE. In a moving train it is just so cool to see. 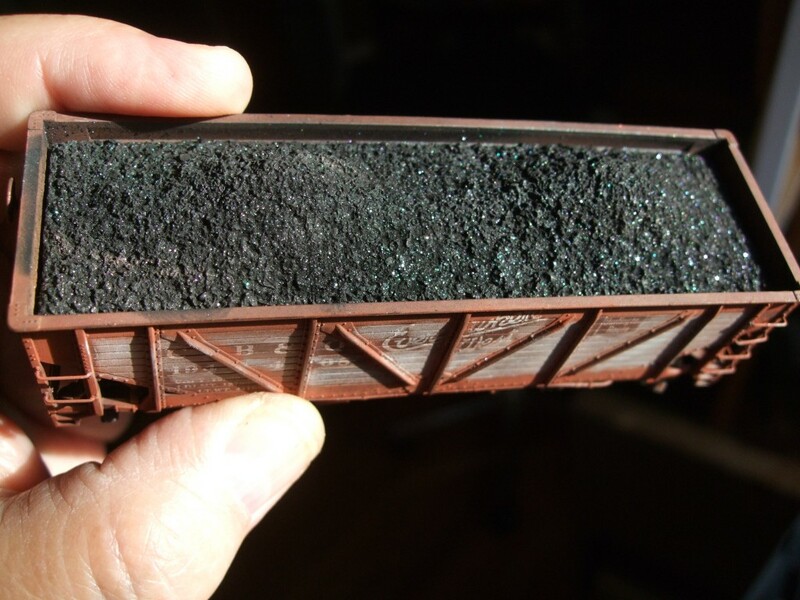 Now you can see the sparkle on the coal. I can overspray the new color with a Flat Finish or not (see my post on this blog about flat finishing). It depends on how often you handle the cars. You should ALWAYS start with a dead flat finish. The sparkles will matriculate to the car sides if untreated so an overspray will keep it neater. Prototype photo from fallenflags.com website. 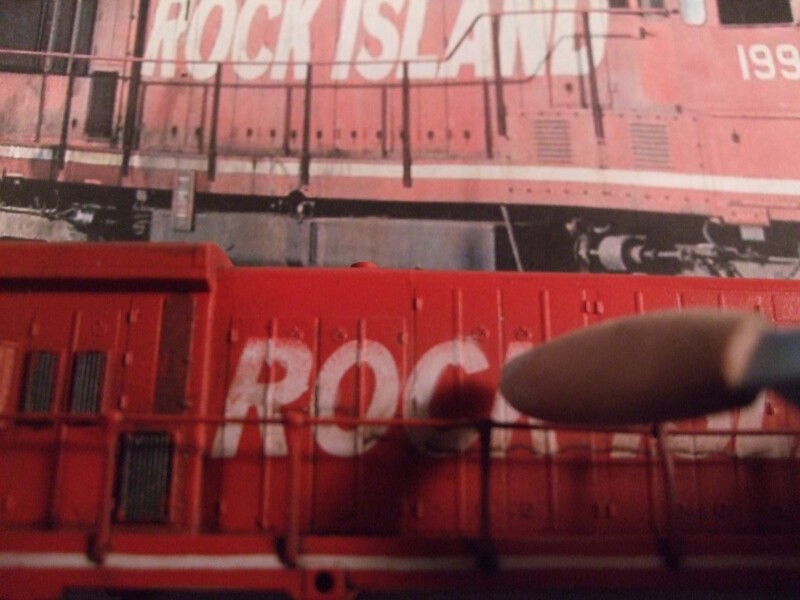 Let’s look at this Rock Island GE U-Boat. We can do some interesting Art with these. The Yellow nose can be faded with a 250.8 Diarylide YellowTint . The sun-bleached Rock Island nose decal cam be replicated by carefully cleaning the herald on the nose from excess yellow or fading it by adding 100.5 Titanium White . It all depends on what photo you are using for your inspiration. The side doors were frequently taken off the car bodies at the diesel repair shops at Silvis, Illinois for engine repairs. The shop personnel would pile the same size doors on a skid. Rarely would they end up on the same unit. Photos show mismatch on the lettering and door colors. An occasional Maroon door would be placed on a Red car body and a bright Red door placed on a faded body. We can do this by masking off the desired door with painters Green tape or Post-It® Notes. Pick the appropriate color or carefully paint with PanPastel. 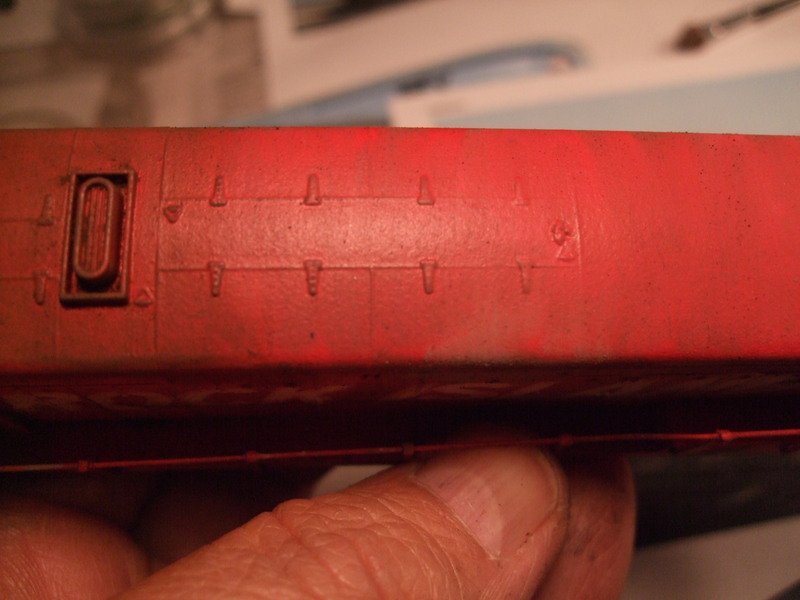 After cleaning with the Mr. Clean pad the red was retouched with the airbrush to restore removed color. Clean up the white lettering with 500.5 Titanium White from my red paint overspray. 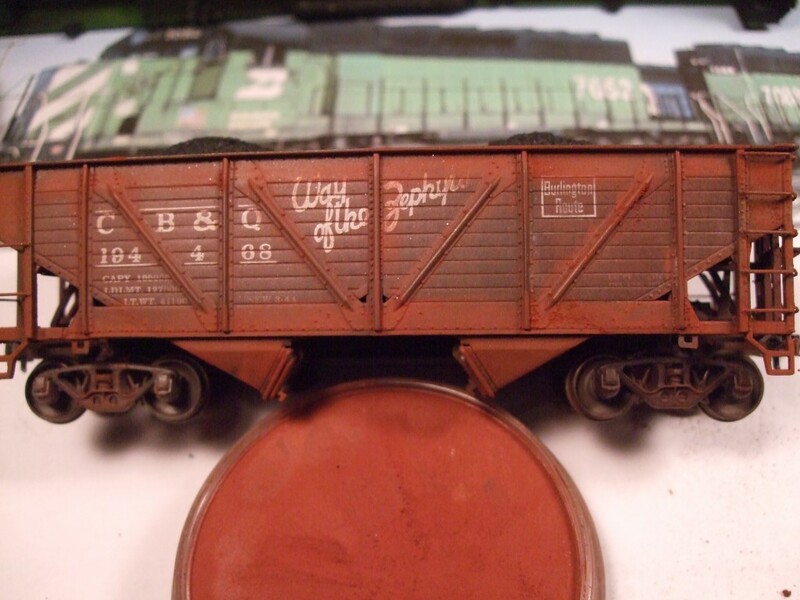 I applied 780.1 Raw Umber Extra Dark to the rectangular car body vents on the side. Burnt Sienna Extra Dark is rubbed on to the radiator grills on top. 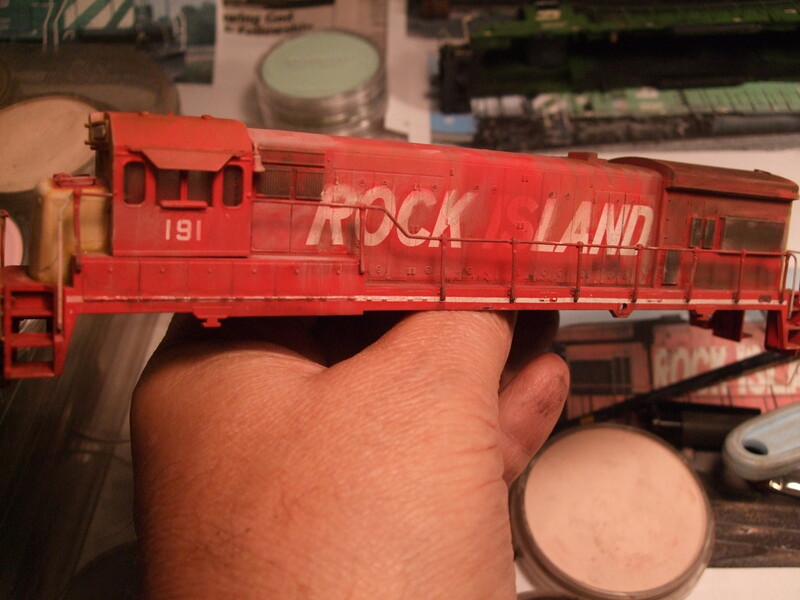 Shading and Fading the long car body side panels with a small amount of 340.3 Permanent Red Shade above the letters RO, 740.3 Burnt Sienna Shade is applied to the exhaust stack, the cab roof and above the letters CK. Using the small brush with 820.5 Neutral Gray above the letters IS. 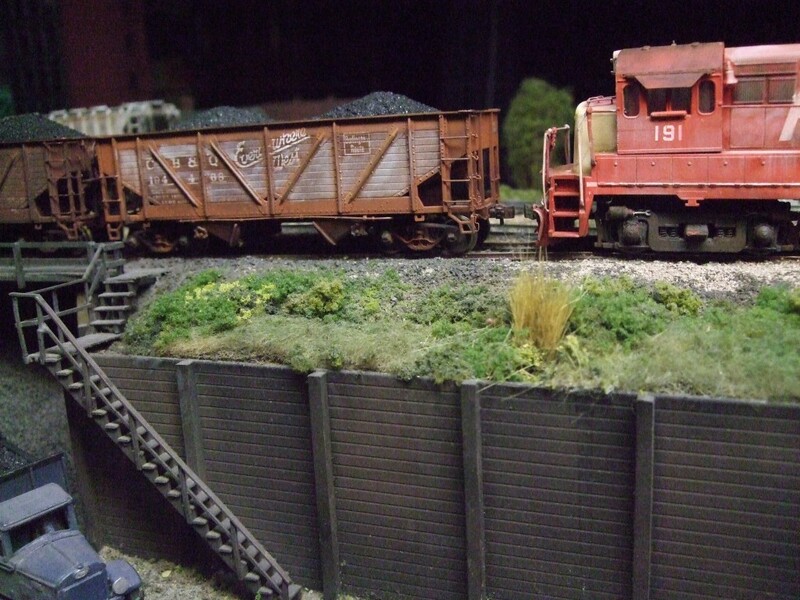 Under my thumb (song reference not intended) some of the 820.5 Neutral Gray and 740.5 Burnt Sienna on the battery box vents and snow plow. 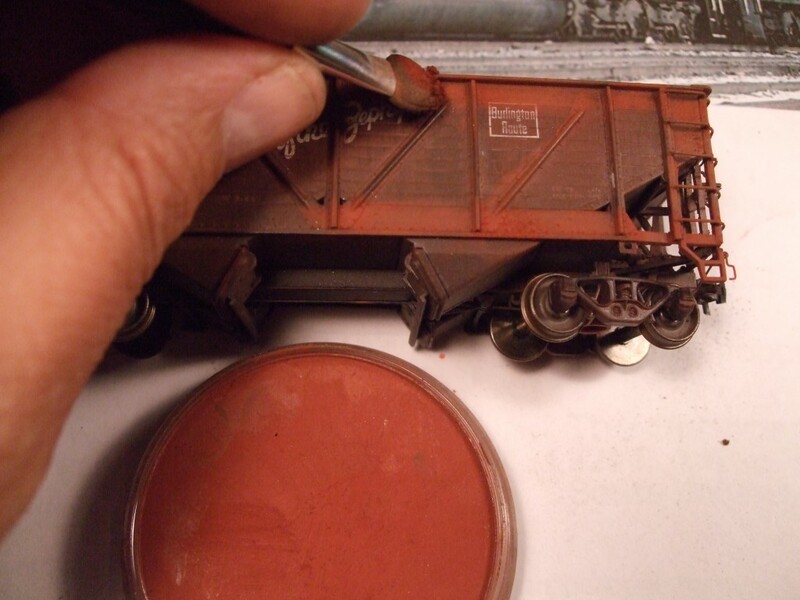 Blending the 820.5 Neutral Grey and 340.3 Permanent Red Shade on the cab and car body long hood. I have scrubbed 780.1 Raw Umber Extra Dark on the walkways using the Sofft Knife with Cover (FLAT). 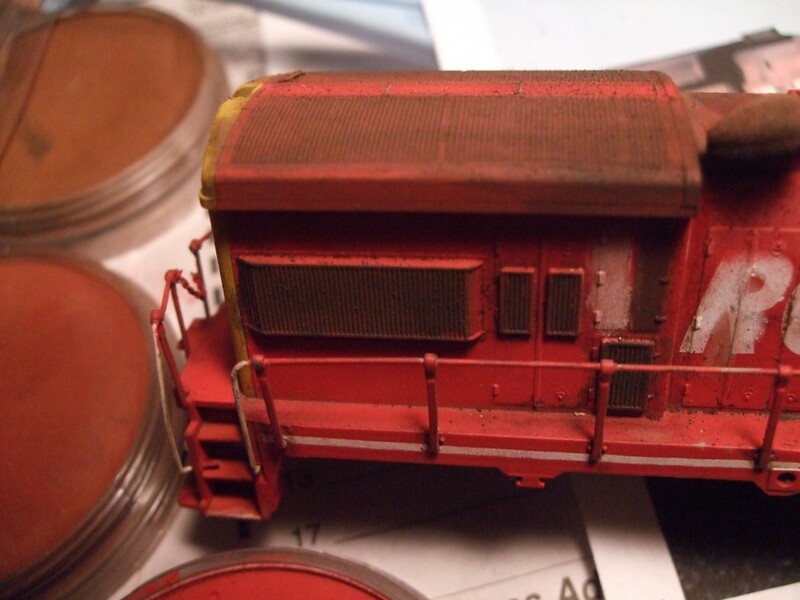 You can also see how I worked some more brown shades into the top of the car body. By this point I was working faster than I could take notes and was mixing colors on the Sofft Tools. Hey I was having fun. 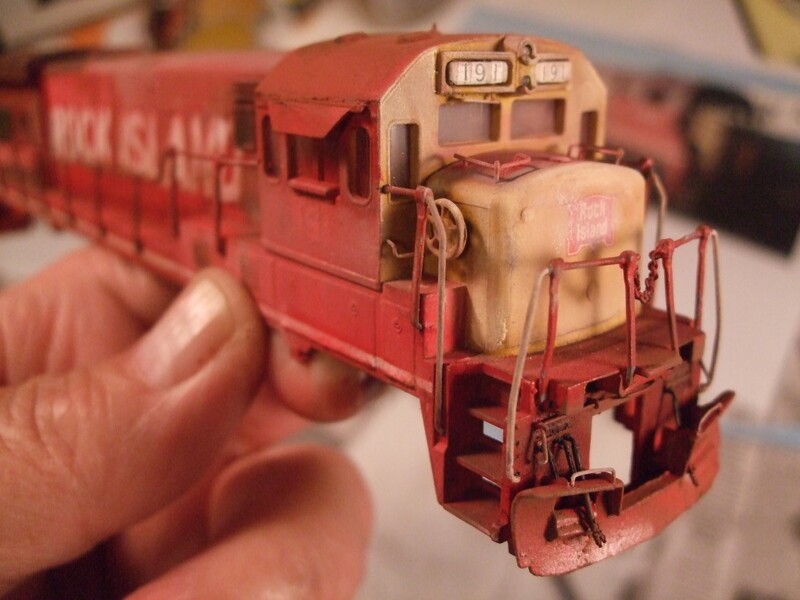 It was cool to see this old model built by my friend Dave Allenson get a second life. 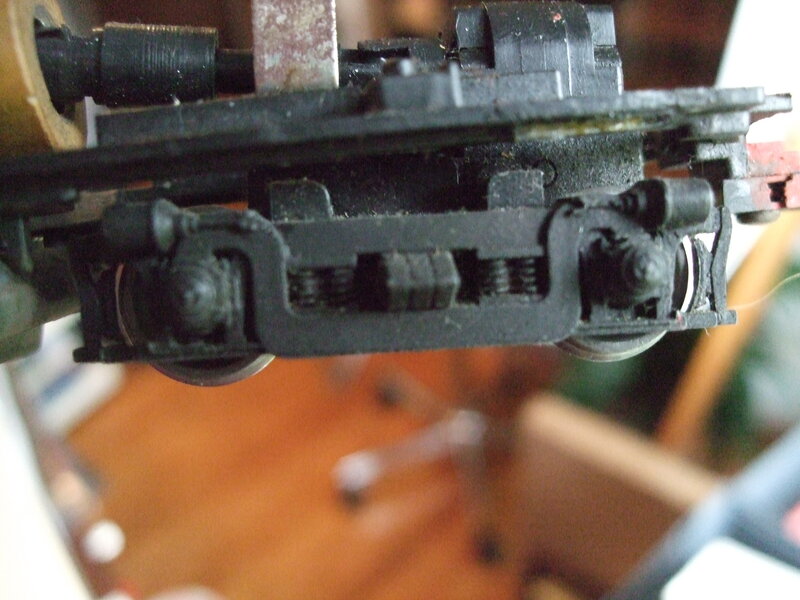 The truck side frame was painted a flat black, not much character showing. A Little 840.3 Paynes Gray goes a long way. We’ll add some 740.3 Burnt Sienna Shade next. 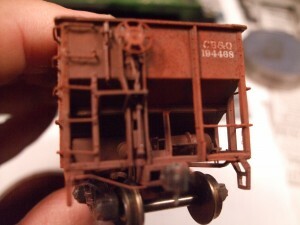 Trucks having RUST and DUST weathering added. Wow! So Much better and see how it brings the details to life. 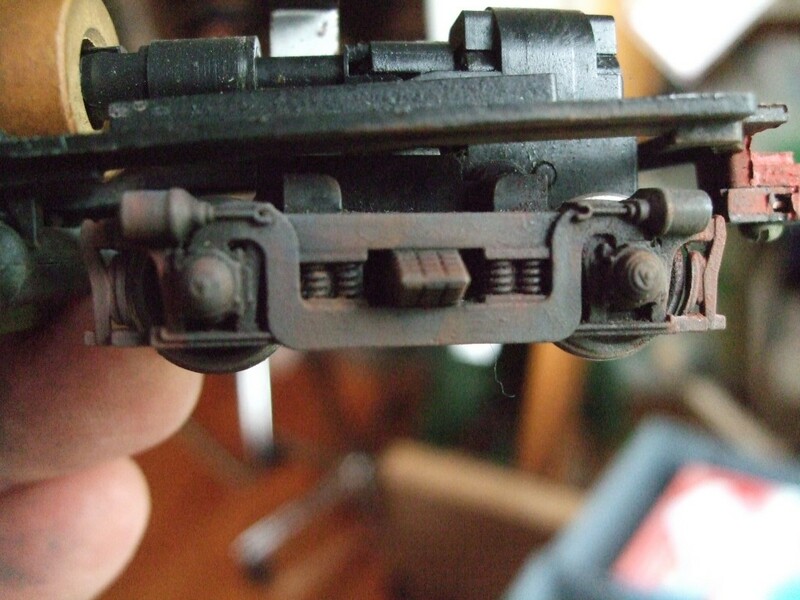 You almost didn’t notice that the brake cylinders were cast in place. 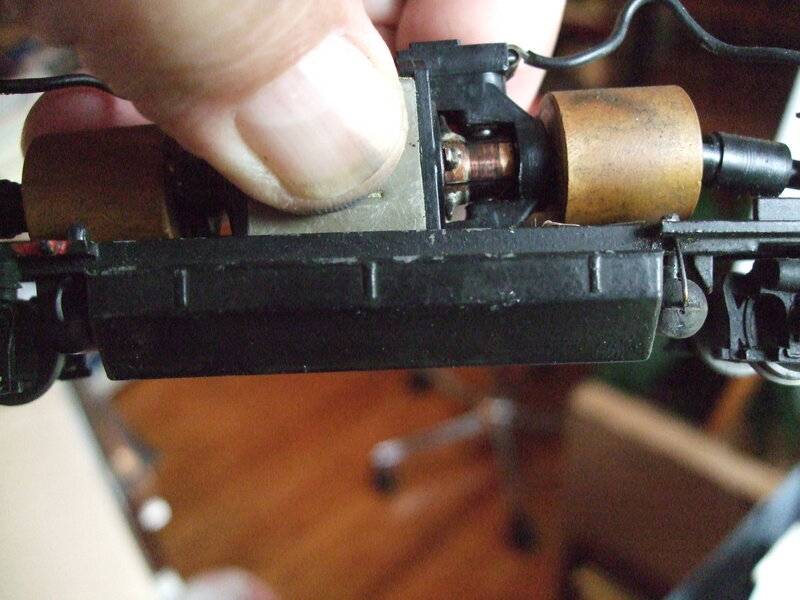 When the trucks were new and in the box they were a shiny un-painted Black plastic. Eeech! That fuel tank is really uninspiring, we’ll take a whole 45 seconds to fix that. That’s what I’m talkin’ about. 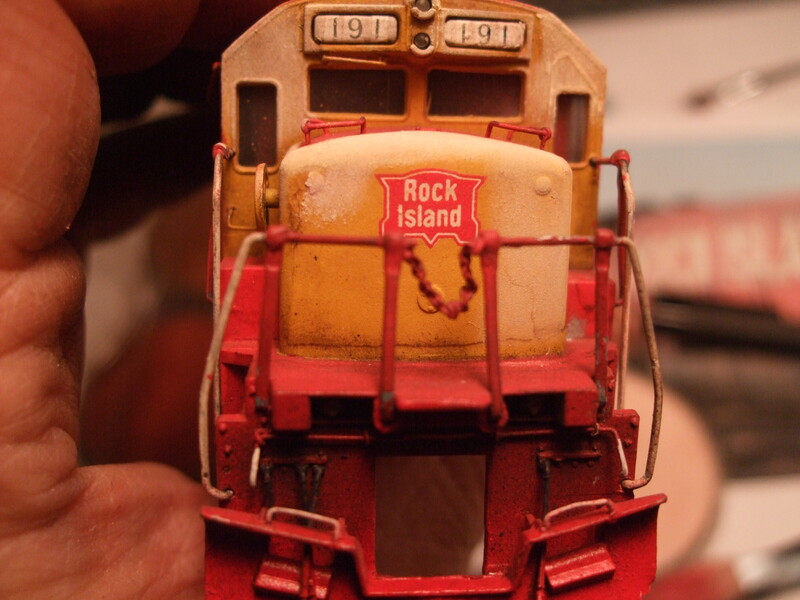 The front and back of the tank were covered in 740.3 Burnt Sienna Shade to show the dirt and grime blown up from the trucks and track conditions. The sides will show some spillage as well. 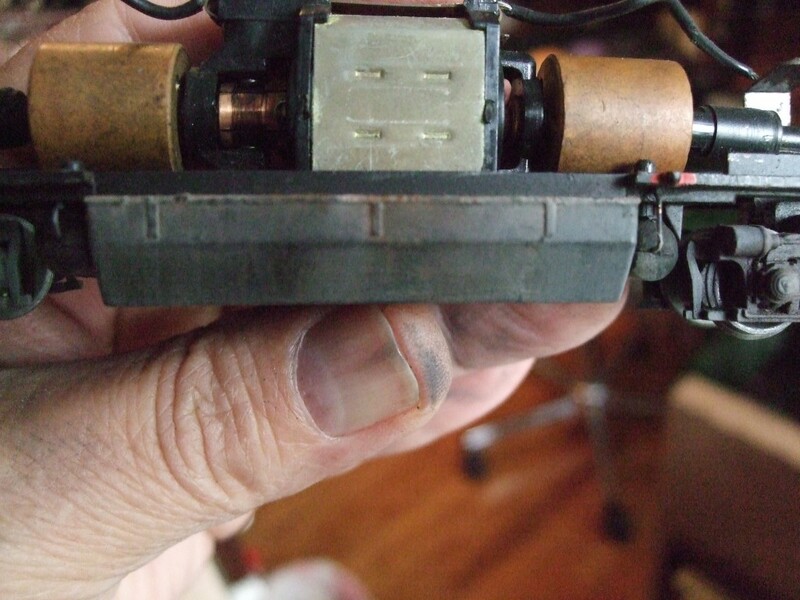 On some versions of this engine the tanks were painted Union Pacific Armor Grey. So always do a little research. 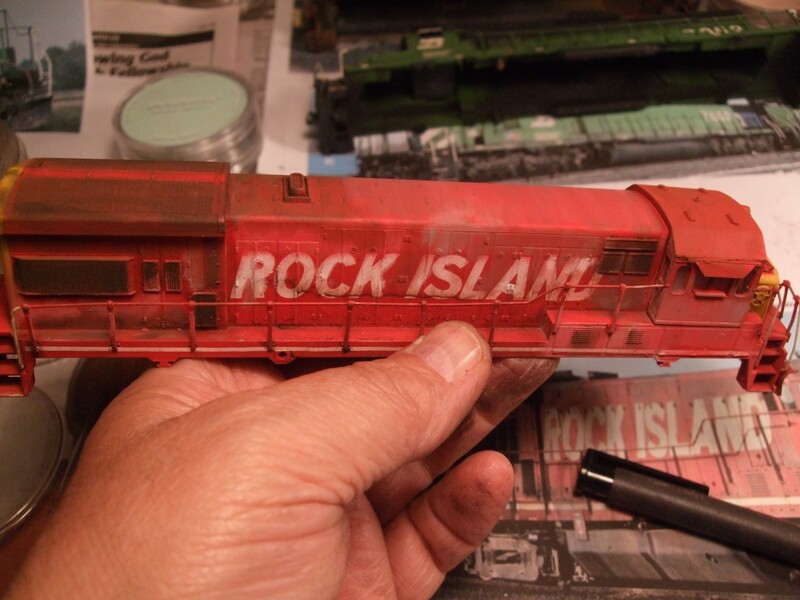 If it is your favorite railroad then get some of the outstanding color books or DVDs available. Please support the website photo libraries that are available. So I’ll see you at the Naperville RPM show or Milwaukee’s Trainfest this year (at the PanPastel table). 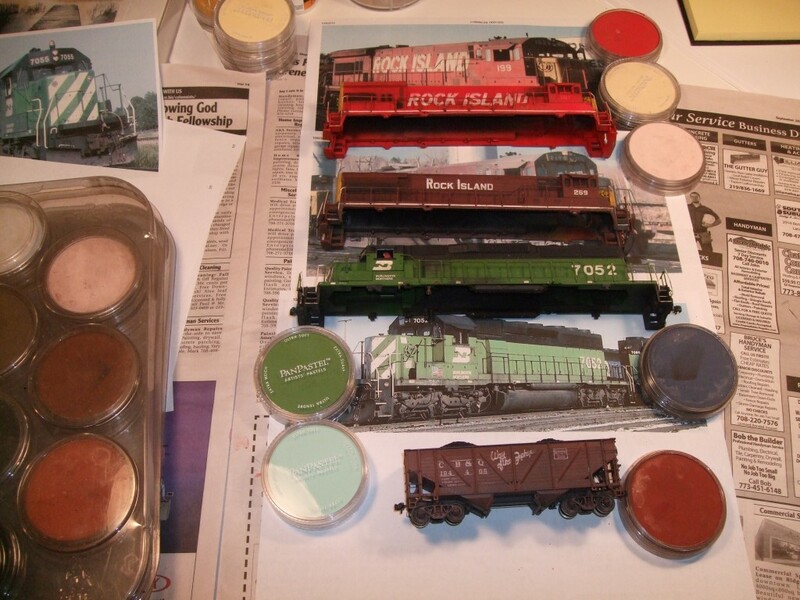 Bring some flat finished cars to try the PanPastel Colors on.